Officially, it's called the "Bob Charles/Phil Mickelson Indoor Backhanded Practice Facility," but I usually just call it the "Lefty Dome" for short. In truth it's much less glamorous than the name suggests – it's a back room at GS Design, where I work, with a blanket hung against the wall and a little piece of carpet for "turf" for hitting practice balls. 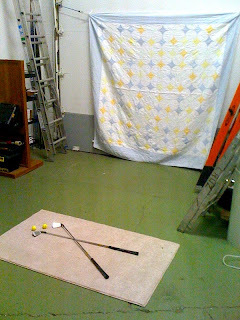 But it's where I've done most of winter practice. Coach Carl told me that the winter before he won the Ohio State Amateur, he spent an hour a day swinging a club in his mother's bedroom (it was the only room in the house with enough space, including high ceilings). An hour a day! Not hitting balls, just swinging a club! That's amazing dedication, and something I think about when things get tedious back among the ladders.